Saint Mary's is lucky to have a very fine church organ of generous proportions to accompany its large congregation and the choir. The present organ was built by Gray and Davison in 1891 and replaced by another, almost equally large, Gray and Davison instrument, which had been installed in the church in 1860 (five years after the consecration). 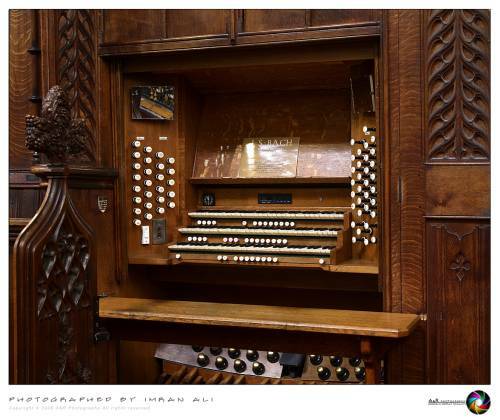 The earlier instrument had 37 speaking stops; the present organ has 44. It has been well looked after by successive generations - though by the mid 1960s it was in quite a neglected state and had become very unreliable. A thorough overhaul took place in 1973, when Rushworth and Draper re-palleted the manual slider soundboards and provided new electro pneumatic underactions as well as cleaning and refurbishing all the pipework and refurbishing the console. More recently, besides providing a new piston system, which is so helpful to the player, David Wells has added a Tuba 8ft rank, a 32' Acoustic Bass (from the pedal Open Diapason rank) and a Trombone 32' bass octave. The blower, which was installed in 1936 is a magnificent example of its kind and has been splendidly restored in recent times. After several years of fund-raising, and a huge amount of work undertaken by our organ builders – Principal Pipe Organs of York – the refurbishment of our organ is now complete. All of the work has been ‘behind the scenes’ and without entering the organ chamber, you will not see any evidence of this. What is most important however, is that the organ is now in a magnificent condition, and will continue to be so for many years to come. The organ looks well and sounds in good voice! It has a fine case with gilded pipes in the chancel, occupying two bays, and another most impressive case of gigantic proportions speaking into the north transept. This was used as an advertisement by Henry Wills and Sons in the 1920s when the organ was in their care, as it was for many years.